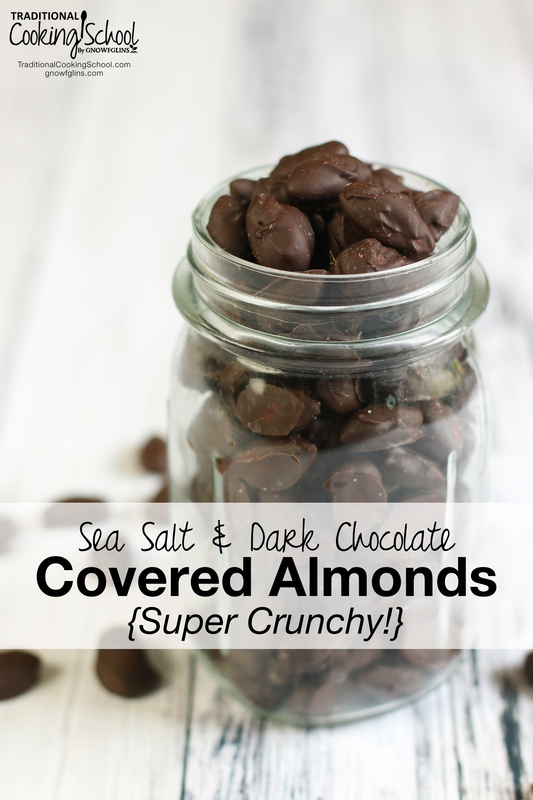 …when he asked me to make him this treat he really loves — dark chocolate covered almonds. He also wanted them to be healthier than store-bought. The answer: Use soaked (and then dehydrated) almonds. 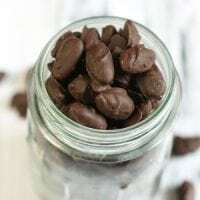 Soaking makes the almonds more nutritious and digestible, and the dehydrating returns them to their dry state… and then some. They actually get super crunchy! Please don't be overwhelmed because I just told you to soak the almonds first. It's really easy to do! In fact, I show you just how simple and easy it is in my free traditional cooking video series right here. And I'm telling you… the jury is definitely not out on these chocolate covered almonds. They are fabulous. 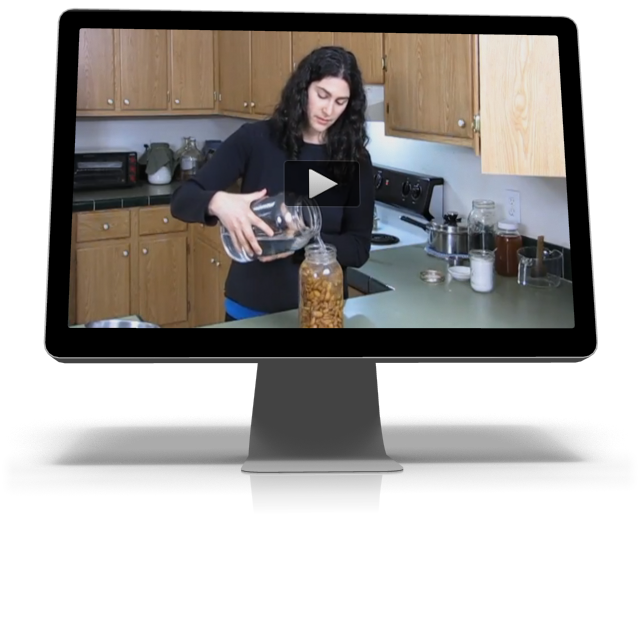 To see how to simply and easily soak almonds, go here to sign up for my free traditional cooking video series. In the quick 5-video series, you'll learn how to soak nuts, grains, beans, and more. And you'll get handy fact sheets as a reference in your daily cooking! Using tweezers (I’m using the ones that came with my serger 😉 ) or a fork, transfer the almonds one by one onto the baking tray so they’re not touching. 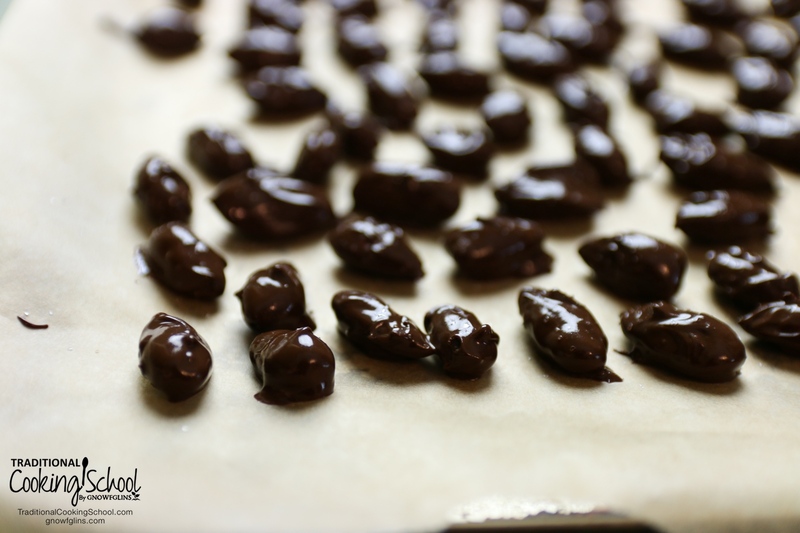 Have you ever made chocolate-covered almonds? Do you like them super crunchy? loved the crunchy almonds all by themselves. But made my first batch of chocolate covered almonds the yesterday. They were enjoyed by everyone. What a treat. could you add a little of coconut oil so they stay hardened and not melt in your hands.?? 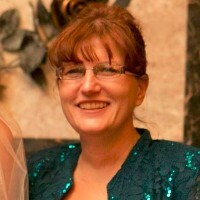 Wardee has this issue, too. They put the serving in a little bowl and eat one at a time from there. Minimizing contact with skin so the chocolate stays firm.